Would you like to take good care of your employees before, during and/or after a rushing and intense time at work? Mobilize your work force now! It is proved, physical exercice regenerate intellectual and focus capacities as self-confidence. You will increase your productivity for sure! 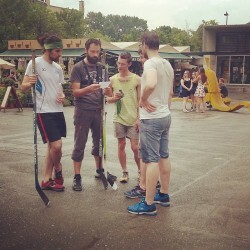 From a simple running tours serie of different Montreal’s neighbourhood, to the big paper chase and party for an exceptional team building day, we organise your project depending on your needs! Team building, paper chase, tested and approved format!